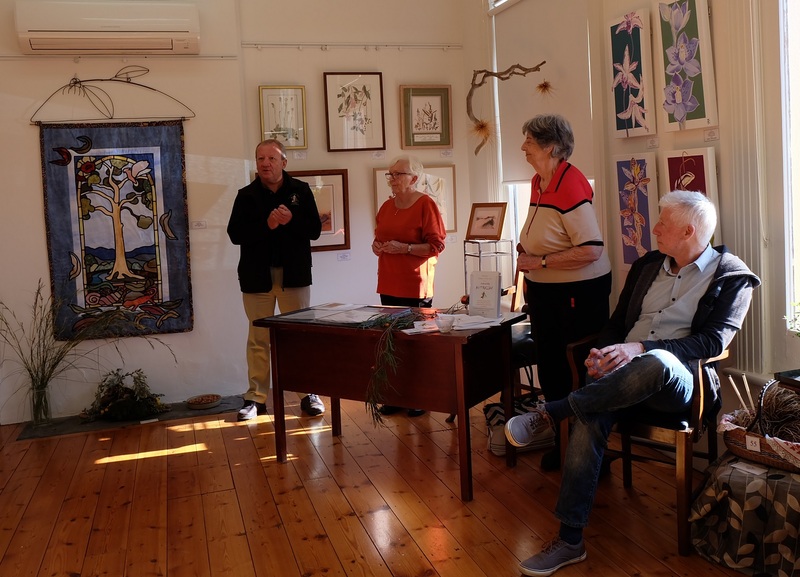 A beautiful collection of art works has been on display at our highly successful art exhibition at the Moonta Gallery of the Arts. 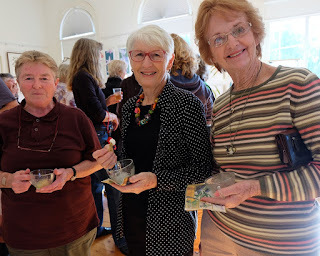 Over 100 items were exhibited from 40 different artists. It is most reassuring that more than half of the exhibitors were not members of APSNYP. Appreciation of Aus native plants is widespread. 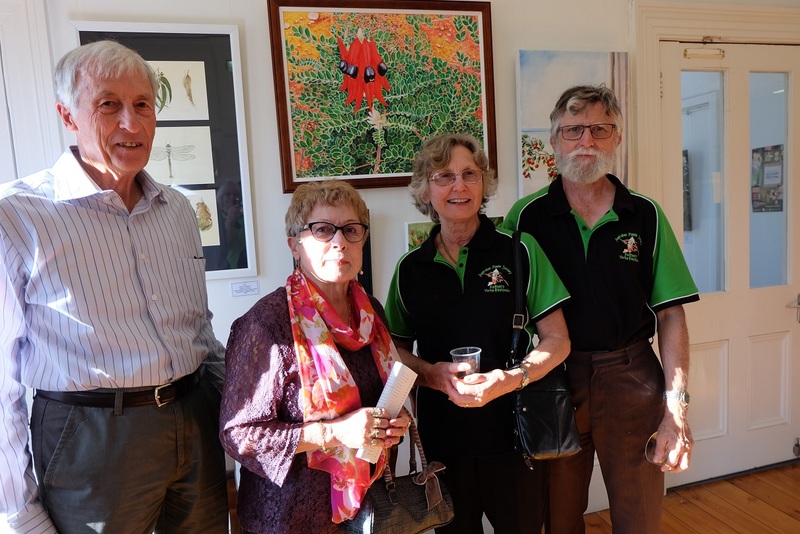 Margaret Lee, state president of APS travelled from Adelaide to open the exhibition. 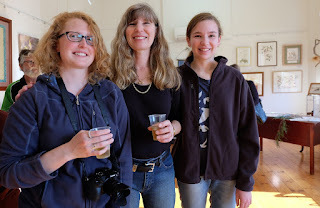 With her are David Sloper, our group's president and Pamela Kerr, coordinator of the gallery. Ali with Margaret and Jan at the opening, and Kate , Lynlee and Catherine. 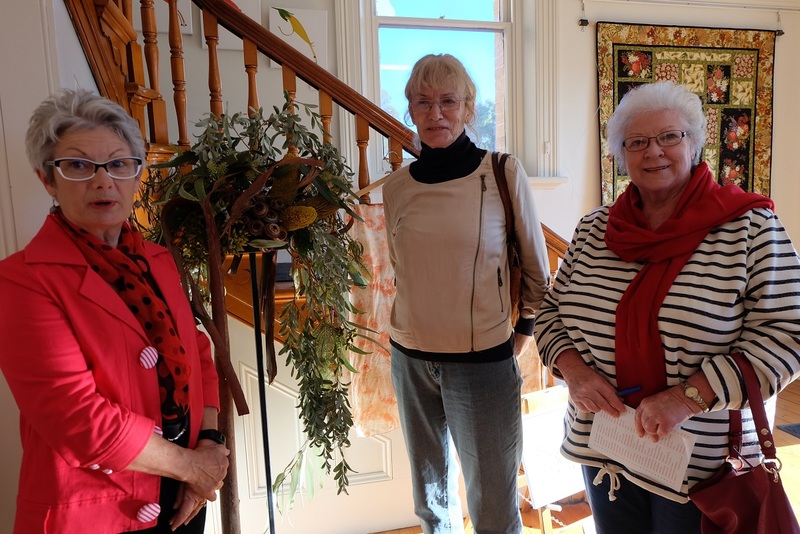 Pam Chapman, Heather Garfield and Kathlyn Fabian all exhibited works to the exhibition, as did Margaret, Jan, Lynlee and Catherine. Many of the works that were available for sale were sold, inspiring the artists to keep creating. 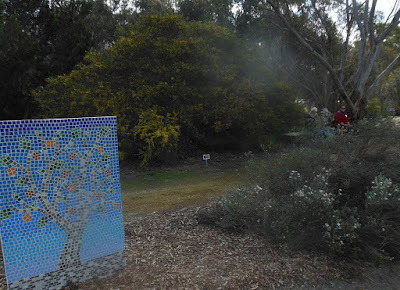 Saturday afternoon was spent at either the Barossa Bushgarden or Don Helbig's remnant scrub. At the Bushgardens, on the outskirts of Nuriootpa, some participants chose to take part in workshops about PH in relation to propagating plants, native flora in art, or in bonsai. 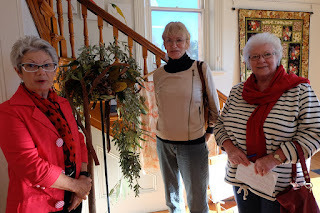 Others of us went on guided tours of the gardens within the Bushgardens. 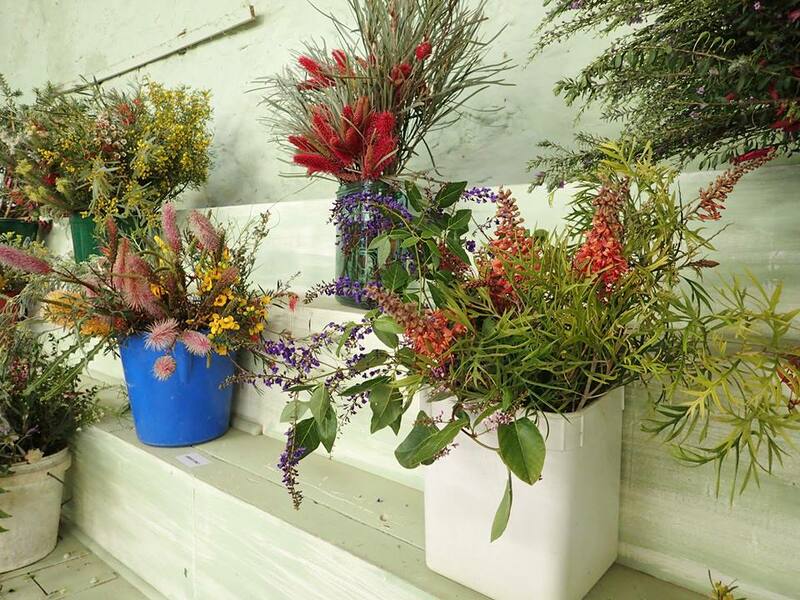 The Barossa Species Garden featured local plants that grow well in home gardens while the Plant Collection displayed threatened species as part of the group's conservation work. The dedicated people who have involved so many community groups in continuing to further develop the gardens have every right to be very proud of their achievements. 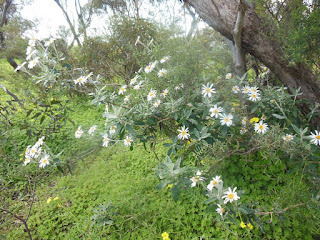 Luckily the rain held off long enough for an explore among the treasures in this rare remnant of scrub in the Barossa. Don has managed this block since 2003 removing weeds, erecting fences and photographing and recording the many species present. 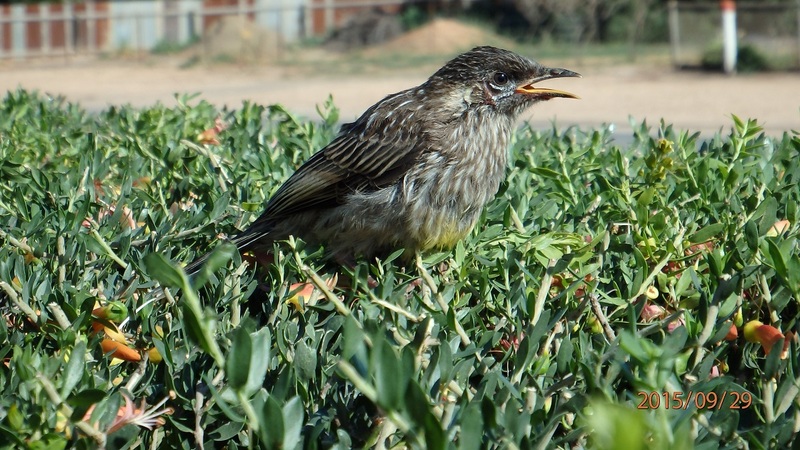 He has re-introduced species known to have flourished in the Barossa prior to clearing for viticulture and agriculture. 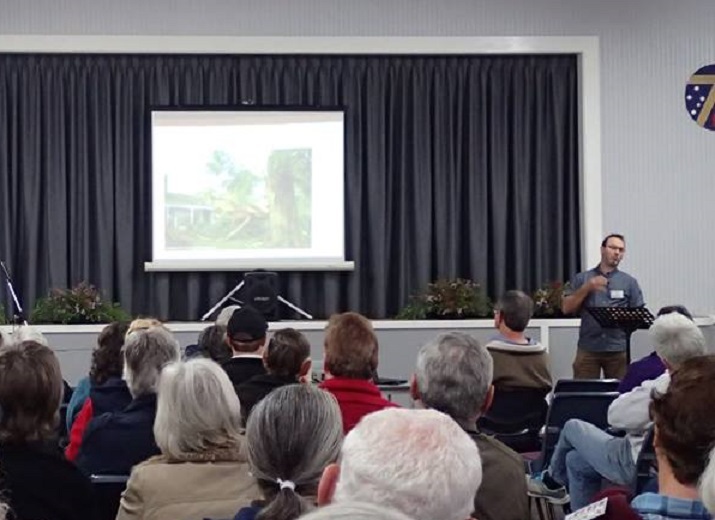 Dean presented an informative overview of his top 10 eucalypts for gardens. 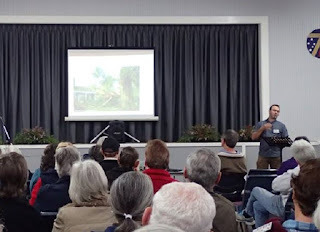 Dean was very articulate in his presentation, easy to listen to and covered information relevant to home gardeners without getting too technical. His presentation included great photos and plenty of content from his new books. Need to visit his website www.dn.com.au or his arboretum at Currency Creek. Daniel made seed collection sound like an adventure! 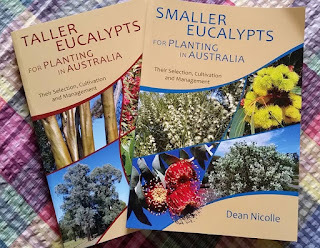 Nice to hear someone so passionate about their job and the conservation of SA plants. 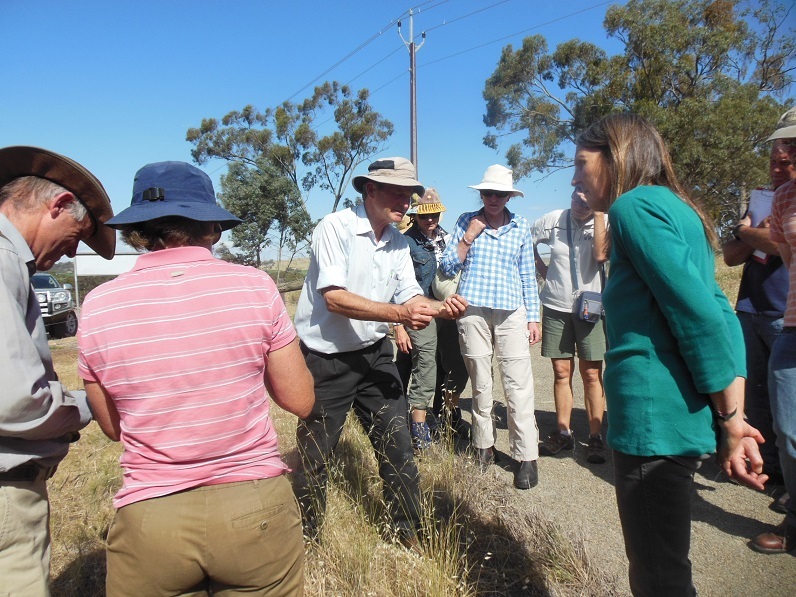 Daniel showed his extensive knowledge of plants and their provenance and gave an interesting insight into his career choice and hands on experience of "seed hunting". Visit the website http://saseedbank.com.au and their blog, "Seed Hunters". Daniel said they are often looking for volunteers and to work on the website and to assist on seed collection trips across SA. 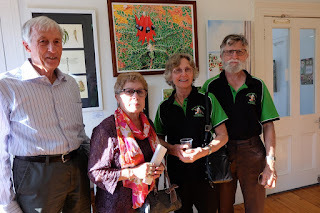 Maree and Graham have spent a LOT of time in the Little Desert, Victoria and their book, "Birds and Plants of the Little Desert" is a beautiful collection of photographs. 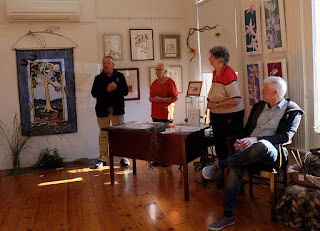 Maree and Graham were very entertaining as they told stories about the amazing creatures they have discovered on their many trips in "their" desert. 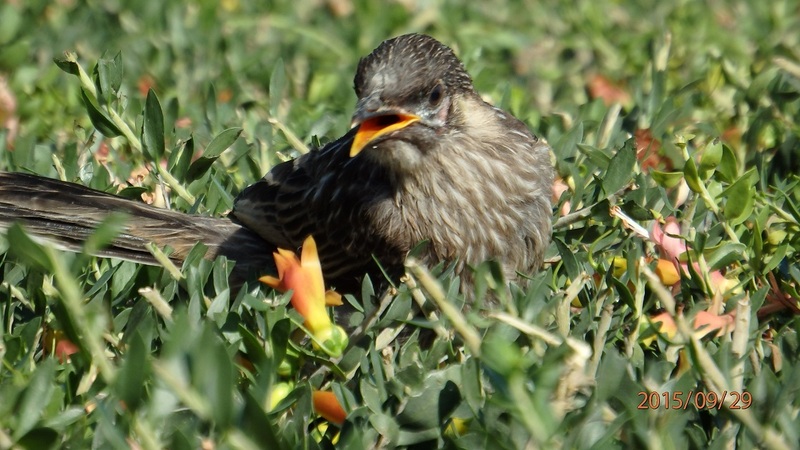 They have assisted with many biological surveys in the area and through out Aus. 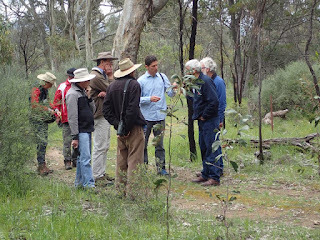 They are the "go to" people when academics and researchers are looking at the flora and fauna of this area and generously shared their knowledge with us. Graham's message was 'come and visit . Be aware and observe closely'. 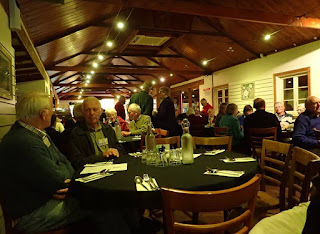 The Company Kitchen in Angaston gave us good food and a warm setting. The delightful company and excellent speakers turned a very cold night into very enjoyable evening. And thanks Lynlee Sloper for most of the text and photos in this post. 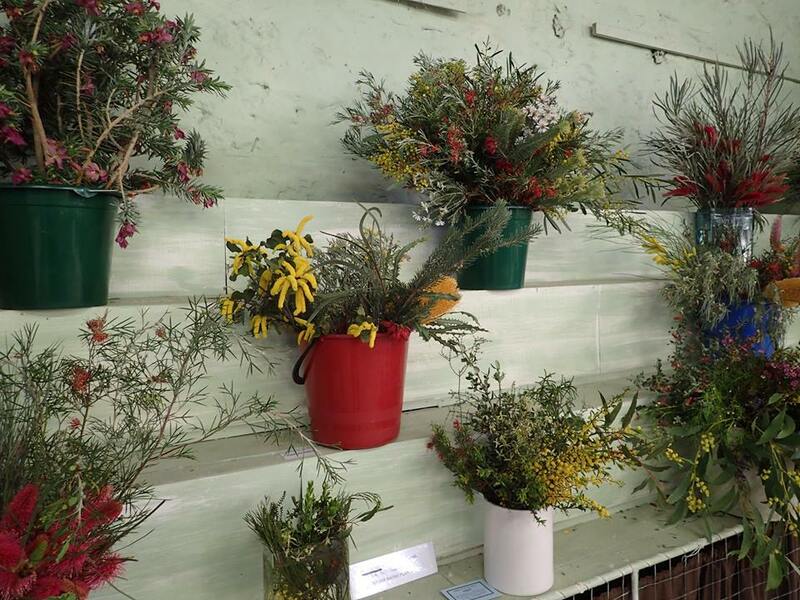 This year we changed what we do for the Kadina Show. Few people were going to be here to enter exhibits for the competition so we scrapped that idea, except for children. Instead we collected buckets full of large specimens from our gardens and more or less plonked them along the shelves. We put the small stems that we'd normally in our species display into a couple of improvised vases. The school children's art in the background added to the cheerful effect. Many people were full of praise for the different display and the small team doing the exhibit were relieved that it worked out well. So much to learn - so many new concepts and words. 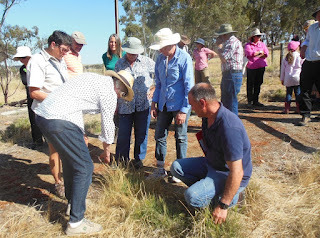 The native grasses workshop was a very worthwhile day for our members who joined the 20 or so participants in Clare. Lots of plants we call grasses and have a common name like 'iron grass' but are rushes or sedges. 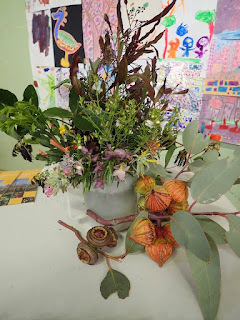 It was great to be able to handle various plants and listen and ask questions to discover the distinguishing features of the different families. It's so much easier for me to learn by doing rather than reading. Grasses have leaves that articulate - that was new to me. Rushes have many seeds as tiny as pepper while sedges and grasses have one seed per flower, and all very tiny. Out in the field at Pink's Reserve it was satisfying to be able to identify some of the grasses and the weeds. And to apply new trick of pulling the suspect grass - annual grasses pull out easily and are almost always introduced plants (weeds). It was good to see the work of the Trees for Life group in reducing the weeds and maintaining the native grasses in this open grassland area. 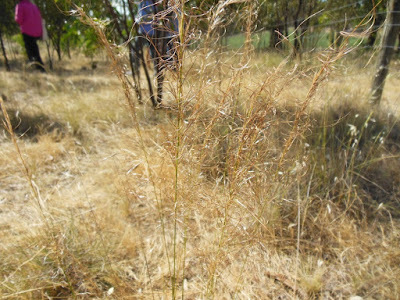 This austrostipa is a shiny bronze colour with awns spiralling beautifully on the end of each seed. I may take for ever to distinguish between different spear grasses but I now really appreciate the marvellous intricacy of the plants. 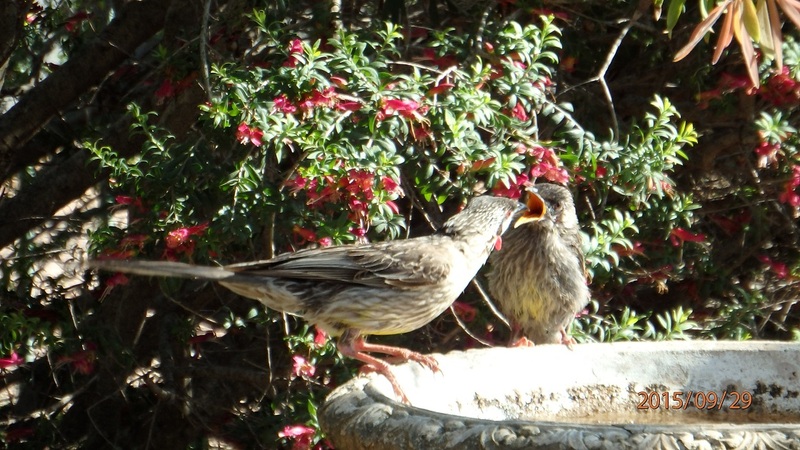 Jan White has an excellent bird hide in one of her bushes and is being rewarded with beautiful sights and excellent photos. 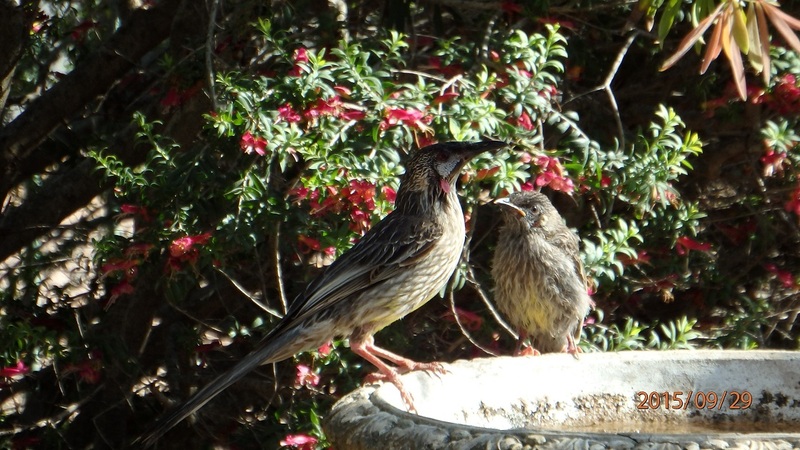 She took these great shots of young wattle birds on their first day out feeding, away from their nest. Don’t you love the look of concentration on the fledgling’s face at the bird bath. 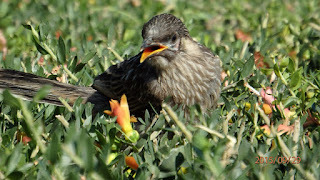 The eremophila hedge makes a great landing spot for wobbly first flights. APS members took a self guided tour of the former Recreation Ground and Richman’s Way to check out the revegetation work undertaken by plant buff, Mike Austin. Mike has been propagating shrubs and trees seedlings then planting them out at the mines for four years and has made a great improvement to the area. He’s planted a wide variety of native grasses, shrubs and trees, some from the local area and others from all around temperate Australia. Acacia notablis (notable wattle) looks magnificent in June with its golden flowers and red trim on the leaves and stems. 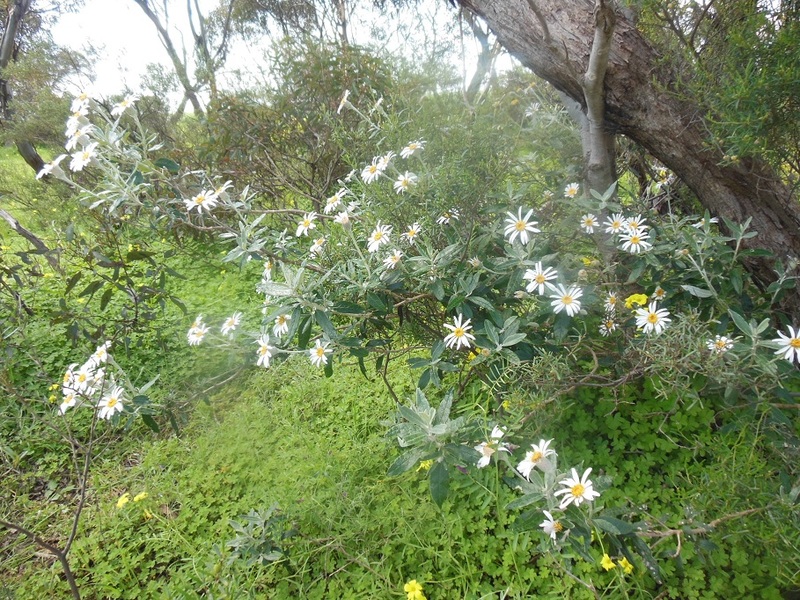 They are flourishing near the Magazine along Ryan’s Road. 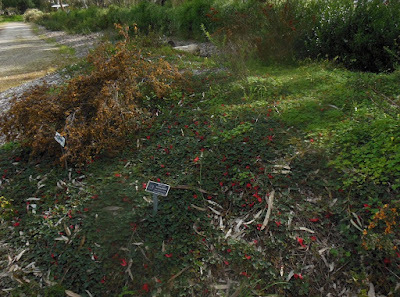 Also in the area are Eucalyptus lansdowneana (narrow leafed red mallee) and Grevillea olivacea (olive grevillea), a couple of imports that seem to be coping with the difficult soil of the mines. 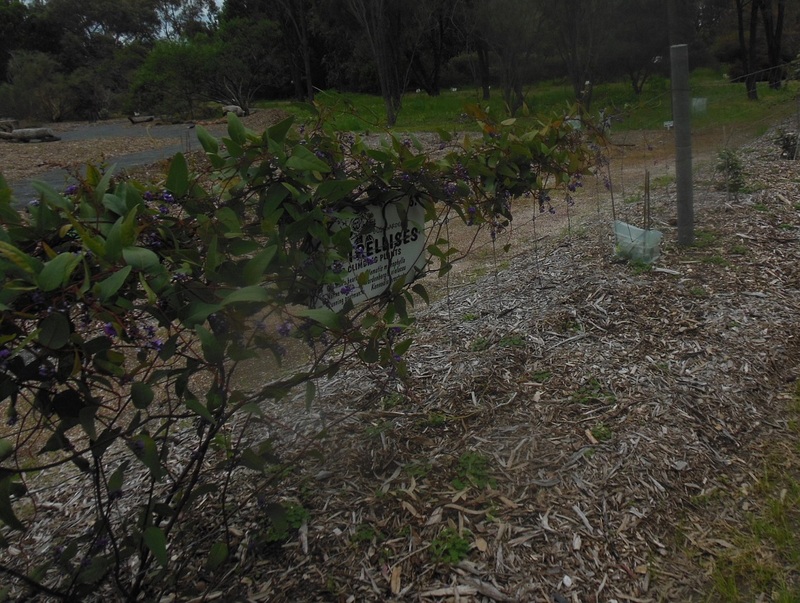 Further along the trail is a planting of several Templetonia retusa (cockies tongue), Eremophila maculata (spotted emu bush) and Dodonea lobulata (hop bush). Most of these young plants are flowering now so this should be a very cheerful spot to come in future winters. In other areas there were well established native trees and bushes. 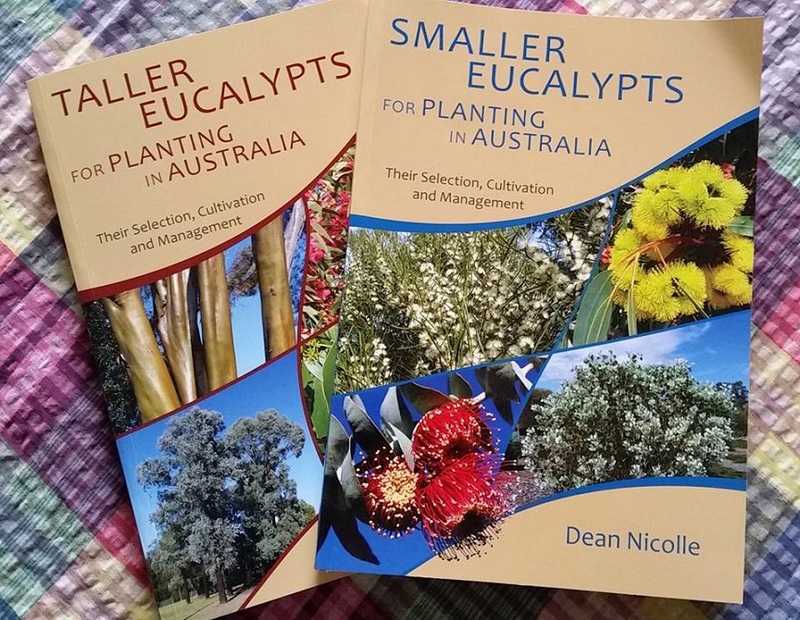 We came across a very big Exocarpus syrticola (coast cherry) and a beautiful (Eucalyptus leptophylla) narrow leafed red mallee. It’s inspiring to visit a place where people have revegetated areas that have been used, then neglected by our forebears. 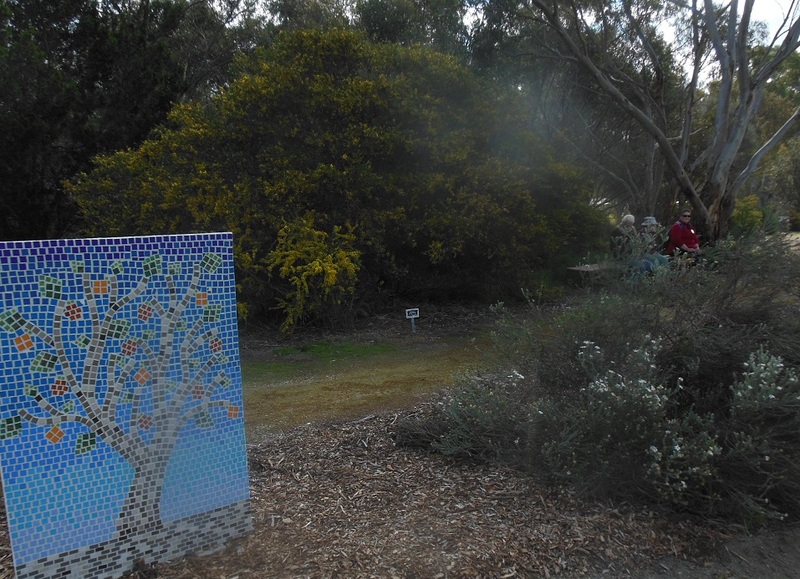 Wonder how long it will take for the area to return to the ‘impenetrable scrub’ that gives Moonta its name.